Best of luck to all involved especially Aoife Collins and Rebekah Lyons!!! The goals here came from Megan Ward, Dervla Buckley (2) and Melissa Hayes (2). St. Kevins with a player of the game performance by debutante Melissa Hayes. The goals came from Megan Ward, Dervla Buckley and Melissa Hayes. 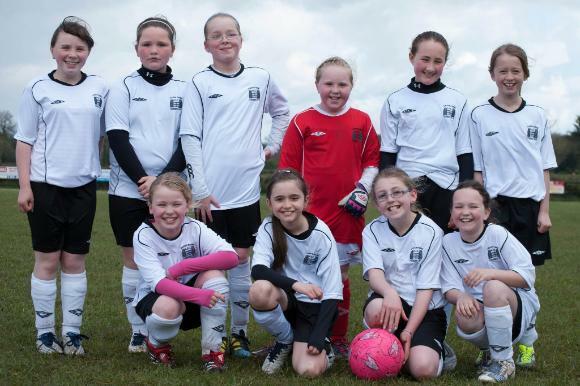 The girls that are chosen for the programme will train every week on the Astro Turf pitch in Two Mile Borris FC until June 2012. They will be coached by FAI qualified coaches. Players involved in this programme in the past have progressed to play on the FAI Regional Emerging Talent Programme, FAI Schools International squad and underage International Squads. Limerick Desmond 4-0 in Nenagh. Monday June 13 at Holycross, Tipperary South came up against Tipperary North in the County Final in what was effectively Cahir Park v Nenagh. Nenagh started strong and brought a commanding lead to the break, running out deserved winners in the end. Dervla Buckley scored South Tipp's solitary goal with a delicate chip over the keeper 10 mins into the second 45, a half in which South Tipp had most of the possession. with a stunner from 15yds, on the scoresheet on March 25. On the day after receiving a This Is Your Life future of Cahir Park award, the Under 14 girls came out all guns blazing in Killenaule against the team vying with them for first place in the South Tipp section. By the end of play the girls had made the winners spot their own, all five goals coming in the first half. Inside two mins Dervla Buckley had the side ahead with a class finish after a cross from the right. After 11 mins, a clearance from defence from Nicola Blake saw Emma Buckley unleash a piledriver from just inside the opposition half which flew past the keeper. Goal of the game came ten mins later when Dervla, receiving the ball from the left, chipped it over her left shoulder and met it with real intent on the half volley to put the visitors three clear. Much to the appreciation of a large Cahir following, another long range effort from Emma ended in the net for The Park's fourth before Aoife Corcoran finished things off with a trademark solo run and great finish. Twelve points out of twelve - no more can be asked of the young ladies - well done all round - next challenge is against the North Tipp runners-up over the coming weeks. Aoife Corcoran, Kerri Purtill, Emma Buckley, Dervla Buckley, Megan Ward. In their third league game in the Girls Tipperary League, the under 14s girls played their first game at Ardfinnan Road, making the most of the excellent facilties. Playing a fine brand of football, they went ahead after five minutes through Kirsty Ardbuckle. The away team tried hard to bring the game to level scores but were to go behind to an Emma Buckley strike from 20 yards after 10 minutes. Both sides, especially the hosts, came close to adding to the score line, but The Park went to the break with a 2-0 lead while on the training pitch, the Irish Paralymic team went through their paces. The second half, played on a lovely mild evening, brought out the best from all 14 girls. Holycross then went on to score their only goal with the rebound off the crossbar, ending up in the net. Megan Ward put two between the sides with a sweet strike after great work on the right between herself and Aoife Corcoran. Aoife provided the fourth after a strong run down the left. Minutes later she could have added her second, after beating two of the Holycross defence and shooting strongly to force a fine save from an in-form keeper. Megan then scored her second of the night with a high quality finish with seven minutes to go. It can be debated whether the sixth and final goal was an own-goal or otherwise. Star-striker Dervla Buckley was never going to have it credited to anyone but herself, however. With nine points in three games, no more could be asked from the girls. The resolute defending of Nicola Blake, Aofe Collins and Keely Halpin, coupled with a strong performance from dependant goalkeeper Rebecca Lyons and Kerri Purtill up front kept the visitors at bay until ref John Lyons' full-time whistle. 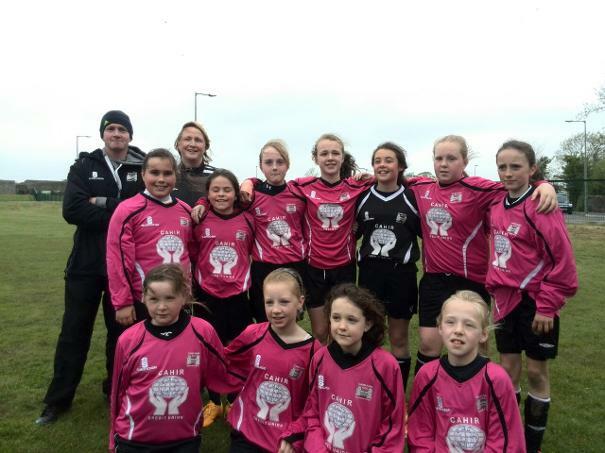 In their second league game in the new girls Tipperary County League, the under 14s again scored full points. The away team, as expected from one of the favourites for the League, were first to try to break the deadlock at Duneske but the Cahir ladies soon found the measure of them, both Megan Ward and Emma Buckley coming very close. It was Killenaule who broke the deadlock on 22 mins when breaking quickly to take advantage of some neat play. With play held up for an injury to the referee, the game finally petered out to see the visitors hold the lead to the break. The second half, played in dry but overcast conditions, brought out a more resilient and confident performance from the hosts. On 32 mins Aoife Corcoran scored a fine equalizer, richly deserved for the efforts on the night. Dervla Buckley came close twice, one tipped over the crossbar from sister Emma’s free-kick. It wasn’t long however until the same combination brought about the lead goal with a volley finishing the latter’s corner. Killenaule, with many County representatives on board, threw everything forward to try to get something from the tie. One again, however, the resolute defending of Nicola Blake and Keely Halpin, coupled with a strong performance from goalie Kerri Purtill held out to ref John Lyons' full-time whistle. Aoife Corcoran, Emma Buckley, Dervla Buckley, Megan Ward. A brilliant performance from the girls in their very first official league game in the new girls Tipperary County League. The home team tried hard in the fine new surroundings for Holycross FC but it was Megan Ward who opened the scoring after 7 mins to be quickly followed by a second from Emma Buckley. Emma, combining well with Aoife Corcoran allowed Aoife to get on the scoresheet after 12mins whilst roles were reversed for the fourth goal on 22 mins. Just before the break a solid defensive performance from Kerri Purtill, Nicola Blake and Keeley Halpin kept a strong home attack at bay and from the resulting clearance, Dervla Buckley scored her first of four just before the break. The second half, played in incessant rain, followed a similar pattern with the Park's training schedule paying dividends allowing them to become stronger and fitter as the clock ticked on. Dervla added two more and a great long-range effort from Player of the Game Aoife Corcoran found the net to make it eight without reply. With great support play from Aoife Collins and Kirsty Ardbuckle, Dervla added her fourth from a well-placed corner and Kerri Purtill completed the scoring before ref John O'Dwyer's full-time whistle brought an end to an enjoyable evening's proceedings. Well done to Darren and Linda for great dedication with this team for many months, the challenge of Killenaule in Duneske at 7:30 next Friday evening awaits. Well done to the Convent Of Mercy Primary school girls 5-a-side soccer team, all of whom play for Cahir Park, who won the FAI competition for County Tipperary and represented the county in the Munster competition in Waterford on May 12.Congrats to Keely Halpin, Dervla Buckley, Nicola Blake, Megan Ward, Kirsty Arbuckle, Roisin Howard, Carol Casey and Aoife Corcoran.